When I was the scrapbook show last month, I discovered a new (to me) company. It is called The Stamps of Life. They have a monthly club and I joined right up. You can either get stamps or stamps with coordinating dies. This month I just did the stamps. But I've already upgraded for next month. 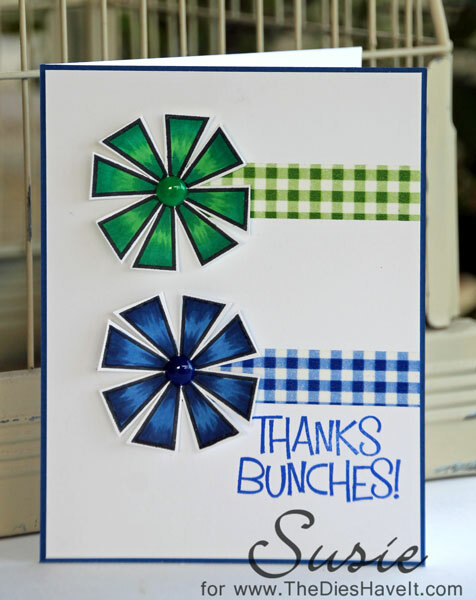 The funky flowers and the sentiment are both from this month's set. Cute, huh? I colored my images and then cut them out. It wasn't hard to find some coordinating Washi tape and all of a sudden I had a card! If you haven't checked out The Stamps of Life...go take a look! You'll be hooked, just like I was! I love seeing all your daily cards. Thanks for the inspirations. BTY, I spent a weekend in January in Stolen Moments. Loved it!